The 80’s gave us so many things, but without a doubt, this decade gave us some of the best music ever. Music so great that we would listen to our favorite radio station all night just to hit the “record” button when that one song came on, so we could add it to our mix tape. As a matter of fact, we made many different mix tapes. We had mix tapes to help us win a new love or to get back that boyfriend or girlfriend. Mix tapes helped our parties become epic! They played in our car while we were alone with our first true love. They were the first soundtracks to our lives. Mixtape, the band, loves the hits from the 80’s more than anyone and we want to take you back in time to experience the way they made you feel. At a Mixtape concert, you’ll enjoy hits from artists like Journey, Bon Jovi, Toto, Huey Lewis & The News, Van Halen, REO Speedwagon, Mr. Mister, Chicago, Bryan Adams, The Outfield, Tears For Fears, Dire Straits, .38 Special, Poison, Night Ranger, A-ha, Yes, Glass Tiger, Bad English, Don Henley, Peter Gabriel, Loverboy, and a ton more! 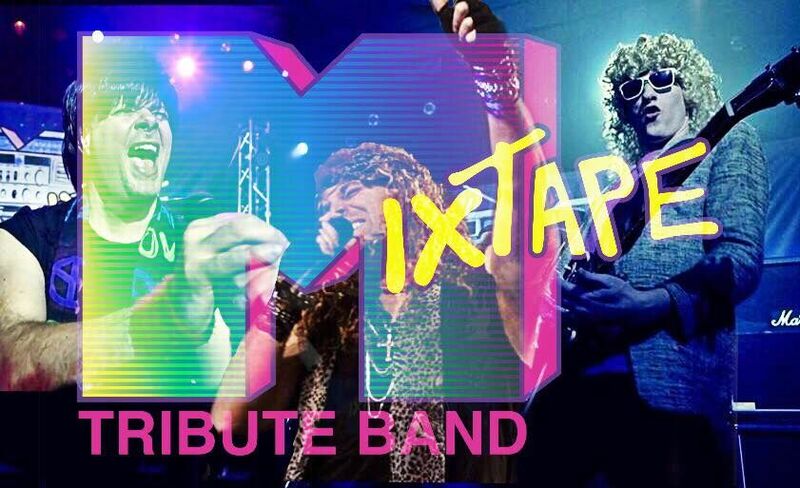 A night with Mixtape will instantly take you back to the glory days of the 80’s! This band is made up of studio musicians who have produced and played on multiple award winning albums and toured all over the globe with some of the most recognizable artists on the planet. But more importantly, this band is made up of six men who are great friends and have a love for delivering great music with expert precision and unparalleled energy. Since every band member is a strong singer, Mixtape delivers a six piece band, three different lead vocalists, and several background vocalists who can deliver brilliant harmonies on any record ever released! Without a doubt, if you want the best songs of the 80’s to take you on a trip through the best times of your life, it’s time to press play on your…Mixtape!